Other Useful Settings Ready to Geocache! Geocaching 102: More fun with Geocaching! Why use c:geo instead of the "official" Groundspeak Geocaching app? The short answer for most people is, c:geo free. For programmers the answer is, c:geo is open-source. For geocachers, it's more robust than the official app. The bad news is, c:geo only runs on Android phones. iPhone users, you're on your own. And fear not, the official app keeps catching up with the feature-rich c:geo app... of course, by then c:geo has lots more features. But what's better than official, you ask? Lots of things. We could list the features here, but tomorrow, or next month, or next year, the official app will have all those features. It almost seems like the developers of the official app use c:geo as a feature list, for what to implement next. And that's ok! For starters, c:geo is easy to personalize. Want to add some text to the end of each log you post? No problem, just add it to your signature, and c:geo will post the date, time, your running total, or many other variables to your log, automagically. Want to visit or drop your travel bugs or geocoins in a geocache? 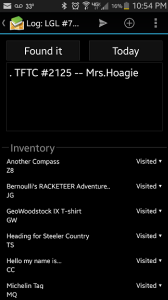 No problem - everything in your inventory is right there on the log page, to visit or drop. Want to pick up travel bugs or geocions from the cache? That's easy, too. All the travelers logged into the cache are listed on the last page of the cache description. Just click on the one you picked up, and log it instantly. These and many other features make c:geo the easiest way to geocache from your Android smartphone. Before you use any smartphone app for geocaching, you'll need to join Geocaching.com. It's free to register. All you'll need is your "geo-name," the handle you want to sign into each geocache. Some folks use their names... others get fancy. Some are very long, but use abbreviations in micro- and nano-sized geocache logs. Some handles (already taken, of course), are Mrs.Hoagie, IMSpider, HarleyMom2004, and MakeTimeToPlay. You get the idea. 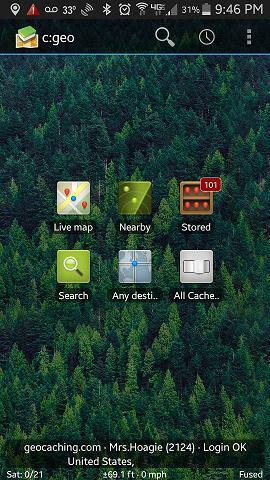 Once you've created your Geocaching.com account, download and install c:geo on your Android smartphone. While you're there, download and install GPS Status and Toolbox, also free; it works seamlessly with c:geo, and provides a great GPS option for your phone. Once you've installed c:geo, click the menu button (top left, three vertical dots) and click Settings. Here you'll find all the important settings. 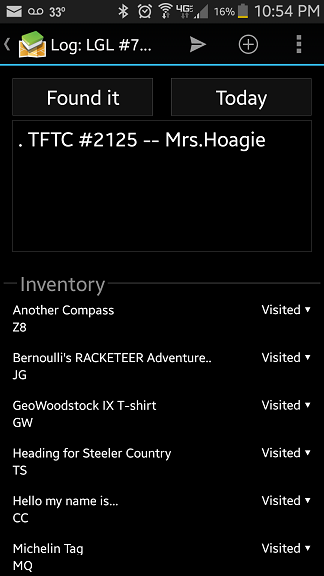 In Services, click on Geocaching.com and enter your username and password. Check your login, and you're ready to cache. If you subscribe to any other geocaching websites, you can enter them here, too. If not, don't worry - you'll have over 2.5 million caches to find with Geocaching.com alone! Other useful settings on c:geo... From the main screen, click on menu, Settings. Mentioned above, under Appearance, check Use Imperial Units to get feet instead of meters (America). Everyone else will want to leave that one set to the metric system... and eventually maybe America will catch up? Under Maps, you can select the default Map that's displayed when you select to Map the cache location. As a premium member, I have mine set to Google Satellite, but my hubby, our chauffeur, prefers Google Map. Also under Maps, I like Show Waypoints. This means when you zoom in on a cache on the map, you will see the "other" waypoints associated with that cache, whether stages of a multi, parking, trailhead, or other waypoints. Handy! Under Logging, you can enter a default signature to begin (or end) each of your logs with. There are "variables" you can add, so I've specified (what's inside the quotes) ". TFTC -- Mrs.Hoagie #[NUMBER]  When I begin a log, it automagically contains my thanks, name, and the number of that cache (I'm on 2009 right now). There are lots of other things you can add, too, including date, time, user, CO, and more. Logging is also the place to set your default for Trackables in your inventory. I have mine default to "visited" and then I manually update the one I'm going to drop in the cache, if appropriate. Under Navigation, you can select the default first and second navigation tool you'd like to use. You can always access other tools, but these two will be on "top" when you bring up the Map menu in a cache. Before I set these, I download the free app GPS Status and Toolbox. GPS Status works seamlessly with c:geo, and provides better GPS/Compass than the built in Compass. Then I set my Primary Navigation to Radar (GPS Status) and my secondary to Map. Again, hubby is the chauffeur, so he selects Navigation (Driving) for his secondary tool. If you'd rather a tool just not show up on the list, you can remove it at the bottom of the Navigation I don't ever use the Compass, so I've unchecked it here. These configuration options should make c:geo even more valuable for your geocaching experience! Entering c:geo, you'll see... your regular phone background shining through, with controls on the top, 6 buttons in the middle, and details about your location and geocaching login on the bottom. If the bottom of your screen doesn't include your location, be certain to turn on Location Services in your phone settings (outside of c:geo). If it doesn't include your geocaching name and the number of caches you've found, revisit Basic c:geo setup, above. The six buttons in the middle are the basic c:geo functions. 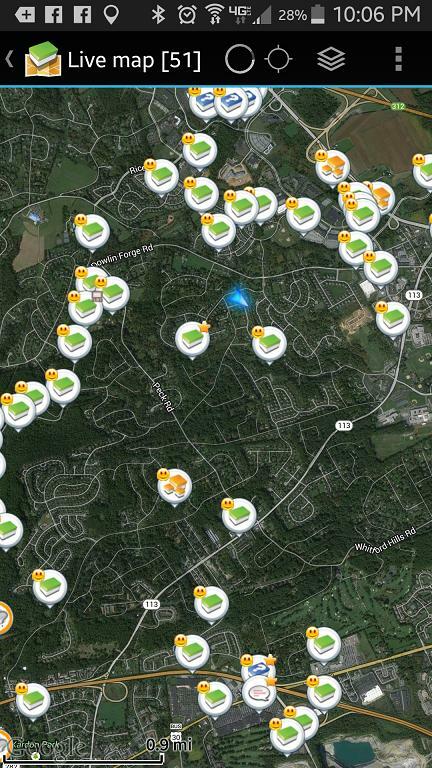 Live Map and Nearby give you the nearest caches. Stored shows lists of caches you've previously stored on c:geo. This is particularly useful when you're heading into a region with poor cell coverage, as you can cache from the stored entries without any phone access; your GPS chip still works! Search features the same search options on the Geocaching.com site: by coordinates, address, GC code, keyword and more. You can even search for trackable items here. The Any destination button allows you to navigate by bearing and distance, a useful feature in "offset" caches. If you don't understand this, don't worry. Just remember that next time you read a cache description that asks you to use distance and bearing to find a location from your current location, come back here. The lightswitch at the bottom right of the six buttons will come in handy when you're looking for a specific type of cache: Events, Mystery caches, Webcams, Earthcaches, or any other cache type. Click Live map to see all the geocaches near you now. The blue arrow is your location. Those caches that feature a smiley face are those you've already found; those that feature a star are those that you are the Cache Owner (CO) of. You can turn off the appearance of geocaches you own or have already found in c:geo Settings; review Other Useful Settings to Exclude Own and Found. Click Nearby to see a list including the 20 nearest geocaches. Scroll to the bottom of the list and click Load More Caches to... to load 20 more caches. 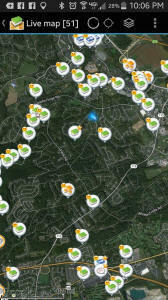 Once you're happy with the number of local caches loaded, click the small map near the top middle of the screen to see those caches displayed on a map. Once on any map view, click on the stack of squares (top right of middle) to change the map you're viewing the caches on. Note, as a premium member of the Geocaching.com website, you'll have Google Maps as an option on the c:geo app; if you are a basic (free) member, you'll have other map options. Consider joining the Geocaching.com website as a premium member to get access to Google Maps, as well as premium-only caches, statistics, pocket queries, and more. 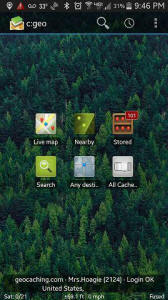 To get details on any cache, simply touch the cache button with your fingertip. First you'll see the summary screen, containing the cache name, type, distance from your current location, D/T, and any favorite points the cache has earned. Here you have options. Click on More details to go to the full cache description, or Store to save the full cache description to your phone. More details brings up the main cache details page, including owner, date hidden, coordinates, and any cache characteristics. Don't remember what mushroom-shaped cache characteristic means? Just click on the list of characteristics to see them all in words. At the bottom of this page, you'll see a small map. Touch this map or the arrow and point (top right of middle) to navigate to the cache. Select your navigation method (Map, Compass, Radar if you've loaded the GPS Status app, Driving Directions, etc.) and you're off! If you'd like to configure what options do and do not appear in the cache navigation menu, revisit Other Useful Settings, Maps. That's only the beginning of the cache details, however. To the left, you'll find any other waypoints that were either provided by the Cache Owner (CO) or added by you, when you solved a puzzle and updated the coordinates on the cache. To the right, you'll find many more screens, including the full cache description and hint. Touch the hint to instantly translate it from Rot13 code. If you're a premium member, you'll also see any Personal Notes from the geocaching website on the bottom of this page, and you can edit and upload your Personal Notes right from c:geo. Further to the right, you'll find the most recent logs, including the standard information on Cacher, Found/DNF, Date, and the number of caches this cacher has found to date. The next screen to the right are the most recent logs from only those geocachers you call "friends" on Geocaching.com. The next screen includes pictures, if there are any, stored with those logs. Further to the right, you'll find a list of all travel bugs and geocoins registered as being in this cache. This is a great new feature, which allows you to "grab" travelers right from the cache screen on your phone. Just click on the traveler you've picked up, enter it's unique code, and type in your log. Click Send (the paper airplane picture, near the top middle), and Voila! You've picked up a travel bug! After you've found the geocache (or not), click the three dots (top right) to Log your Visit. This is also the place to go to find other caches around this one, or to open this cache in your browser (a useful feature for some puzzle caches that include graphics, including animated gifs). While logging the cache, you can touch the status field to change from Found it to Didn't find it, Write note, Needs Maintenance or Needs Archived, plus available extra options if you're the Cache Owner. The date field allows you to log today, or days past. Add your log comment here. If you'd like some default comments to include on every log, return to Other Useful Settings, Logging to set up your default log. Drop off, Visit, or Do nothing for each of the travel bugs and geocoins you're carrying in your inventory (actual trackable codes will appear here; blacked out for sample purposes only). When you're done logging, click the Send (paper airplane) button to submit your log, or simply back out of the logging screen to save the log as written so far, and come back to finish logging later. If you come back on another day, c:geo will remember when you saved this log, and adjust the date accordingly. If, by chance, you need to completely discard the log you've started, click the three dots (top right) and select Clear. Voila! You've found and logged your first geocache via c:geo. Now you can geocache anywhere you've got your Android smartphone and a few space minutes. You'll be over 2000 geocaches found in no time at all! Back on the main screen of c:geo, you saw the icon for Stored geocaches. But how does a cache get Stored? Simple. When you're looking at the cache details (or the summary box, before you load the details), click "Store" [in the red box]. Now the cache is stored for offline use, in a default list called Stored. Not only is the geocache stored, but if you've started writing your log, the log and the date you started logging it are also stored. Static maps for each cache are stored, but by default, static maps for other waypoints related to the cache, and images in logs are not stored. If you'd like these items to be stored, too, just go to your Settings, Offline Data, and check them off to store, too. If you'd rather, name the list and store the cache in the newly named list. I have lists for some old caches I'm looking for, a separate list for a large geo-art that I've solved all the puzzles for, but haven't had a chance to find them yet, and a third list of challenge caches I'm working on. While you're out geocaching, a list is a great place to store the caches that you've found, but haven't had time to log yet. Handy! If you're going to be geocaching in an area that has poor cell phone reception, store all the caches you're seeking in a list before you go, then the reception doesn't matter. You don't need it! Each cache with all it's waypoints, logs and other details will be stored on your phone, ready to use. And your phone's GPS works without cell phone reception. Once a cache is stored on your phone, it's loaded. If others have found the cache, or if the cache has been disabled or archived, the copy on your phone won't show the updates. If you're seeking a cache you've stored some time ago, use the Refresh button to reload the cache from geocaching.com, and receive all the updated logs, status, etc. Ever arrive at a latitude and longitude, and have the cache description tell you to go 80 feet in some direction? These "offset" caches aren't common, but when you encounter one, it's great if your geocaching app knows what to do. c:geo does! From the main screen, click on Any Destination, and then click My Coordinates (or enter the coordinates you're supposed to start from, if you're not already there). Then type in your Bearing (head 90 degrees) and distance (in feet, meters, or lots of other units). Click on the Navigate icon (arrow and dot on the top line of the app) and head off to your final destination! It's so much easier than using a compass and estimating the distance. c:geo is not only free, it's the most comprehensive geocaching smartphone app available. Download it to your Android smartphone and try it out today!